Newly renovated! This 2br/2bth unit is just 50 steps to white sandy beaches. There are not even any streets to cross!It is located just one house away from the sand. There are only 4 units in this building so you will enjoy plenty of privacy. Enjoy 2 enclosed porches! around listening to the waves or enjoyed your meals in!. 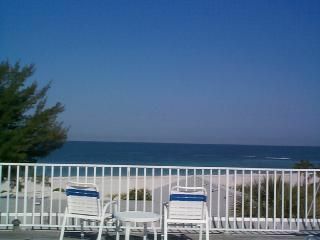 One has access from the master bedroom and family room with a partial gulf view. You won't find this kind of value anywhere else. Enjoy fabulous sunsets overlooking the gulf on the rooftop deck. Plenty of outdoor seating provided. There is even a storage closet in the garage to store any bikes, kayaks, surfboards, etc. that you may have. Everything you need for your vacation is right here. We even have an outdoor heated pool! for your convenience. All new linens for ultimate comfort. Brand new king memory foam mattress with cool gel in the master bedroom! Beach towels, Beach chairs, loungers, umbrellas and toys are provided. Just bring your sunscreen! Newly renovated bathrooms. Beautiful new tile and seamless shower doors. Master has gorgeous granite counter tops with double sinks. Laura's condo was perfect for 2 couples. We loved the location, the beach furnishings, and the overall cleanliness of her place. Even though the weather was horrible, it was still a very enjoyable stay and our guests were visiting AMI for the first time. We will be back again next year. The Condo is great. Location is Great. Island is Great. This was our first time on Anna Maria Island and had a great time. Could not have picked a better condo. As advertised, not directly on Gulf, but so close. We spent a long weekend at this condo and while we were surprised by the 3rd floor walk up, once we got our gear upstairs we had a ball. Pool is great and it is a very short walk to beautiful beach. Condo was perfect for the 4 of us. And the restaurants are great and close. We will be back! We have rented condos all over the US and this is by far one of the nicest. Lovely inside and so close to the beach. Nothing negative to say. Enjoy! I am so happy you enjoyed your stay! Please come back again! We had a great short stay over winter break in this condo. It was really comfortable for the 5 of us and I wasn't expecting such a nice view from the sun porch. The rooftop deck was great for sunsets and the beach was perfect. It was nice to have a heated pool for the December evenings. We rented a golf cart from the strip mall that was walking distance away and enjoyed riding around on island time. Our teens loved walking to Dunkin Donuts and Walgreens too. The place is an older unit in decent shape with fully stacked kitchen. This is second row beach rental, with rooftop view of the beach. If you are in the unit there is really no beach view with the exception of standing in the sun room and getting a glimpse of ocean through dirty scratch up windows. The second bathroom was very small with no counter top space for toiletry bag or makeup. Both bedrooms were noisy, it appeared the noise was coming from the HVAC units placed on the rooftop above the unit. We did not get any sleep and were sleep deprived leaving back home. I am sorry that you did not enjoy your stay at Gulf Beach Place. Anything that I can do to help with future guests I will do. I hope you and your family had a very Merry Christmas!